WATERFRONT â STONY CREEK â "Land Your Dream Here"Â© Located only 19 mi from the Hamptons across LI Sound. One of the most unique settings on the eastern seaboard. 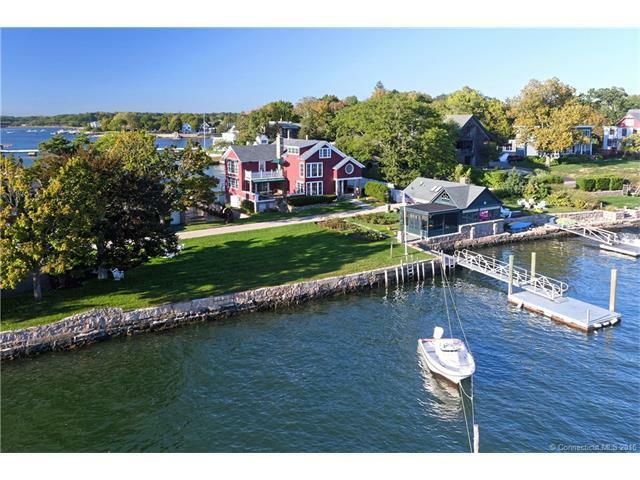 Extending into Long Island Sound this property enjoys 300Â° waterviews and the most captivating vistas of any of the properties along the Thimble Island chain. This compound features a meticulously maintained Manor house with classic 1930 updated features. Great for entertaining with a chefâs gourmet eat-in country kitchen, exposed beams, center island, commercial appliances and wood burning stove. 1st floor has a guest suite or master bedroom, a generous dining room with water views, LR with fireplace, antique mantel and built-ins. 2nd floor features three spacious bedrooms, two with private bath and Master Bedroom suite, all with water views. 3rd floor au-pair or staff quarters. There are two other structures, a 613 sf Stony Creek granite boat house, which is perfect for entertaining or detached guest suite. Features bar, kitchen, full bath, cathedral ceilings, fireplace, central air, screened in porch, finished with the finest materials. The other structure is a fully functional 2318 sf office/studio. Other features include two docks, boat ramp, in ground gunite pool, Arizona stone patio, sitting area, mature trees, rolling green lawn, gardens, beach, generator and three car garage. A perfect family compound or home w/detached office. A must see for the unique buyer and waterfront enthusiast.